According to a 2013 report prepared for the government by the Atkins company, if the HS2 railway were not built, highly disruptive upgrade works would need to be carried out simultaneously on the West Coast, Midland, and East Coast Main Lines. Some of the most expensive works — new tunnels — would be on the East Coast Main Line London approach, to support twice-hourly fast services to Nottingham. So what were Atkins’ actual forecasts of demand between London and Nottingham? The company’s 2003 High Speed Line study for the Strategic Rail Authority showed that the forecast passenger rail volumes between London and the East Midlands (and South Yorkshire) are very small. Consider Figures 2-4 and 2-5 from the study (below). 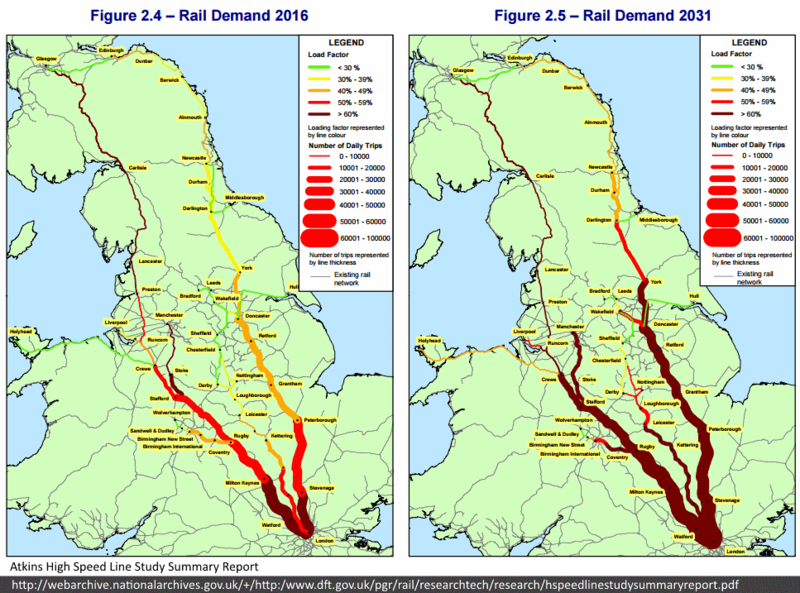 the forecast traffic to and from Manchester, Leeds, Sheffield, Liverpool, and Birmingham does not support construction of new high speed tracks. Atkins did not even bother to show traffic on the Chiltern route, but no doubt, it would be similar in scale to the Midland Main Line. There must be enormous potential to increase throughput on all the existing lines, but especially on the Midland. Superlatives are at the heart of people’s infatuation with megaprojects — the irresistible attraction of building the world’s tallest building or biggest cruise ship (wrote Jacques Leslie). Although Manchester and London are only around 300 km apart, the proposed HS2 railway between the two cities would include sections of track built for linespeeds of 400 km/h. With its £50 billion ‘budget’, rigged economic assessment, and bizarre technical specification, it would be Europe’s most meretricious megaproject.